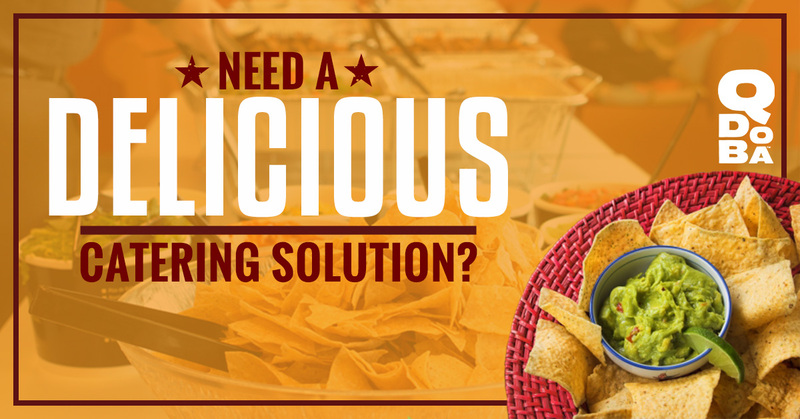 Mexican Catering Laramie: Need a Delicious Catering Solution? Need a Delicious Catering Solution? When you are planning Mexican catering, you want delicious food that satisfies your cravings, that makes your crowd happy, and that is easy on the wallet. Qdoba catering does all this and more. Quench your thirst for Mexican food. We can deliver the answer to your need for delicious Mexican food in several ways, but most importantly, we bring it to you! Qdoba catering brings the answer to your home, office or church to please your hungry crowd. We serve Laramie, Wyoming, Cheyenne, and North Platte! You can have many of the favorites you depend on when visiting Qdoba. You can choose from our Hot Nacho Bar, Burrito Bar, Breakfast or Boxed Lunches. The boxed lunches have a handcrafted, made-to-order burrito so it’s just like coming into one of our many locations and getting just what you want! Ordering the boxed lunch as part of your catering order is even better because we bring it to you! If you’ve got a crowd of hungry people to feed, try the Hot Nacho Bar. You can make them exactly as you like them. Do you like all the ingredients piled high on top of the chips or are you more the type that mixes them all together and uses chips to deliver the spicy goodness to your mouth? When you are planning your next get together, surprise everyone with delicious catering from Qdoba, everyone’s favorite Mexican food!